With its finest architectural magnificence and remarkable history, Mandu continues to fascinate its tourists with a rich and varied past that still witness the love and romance between Prince Baz Bahadur and Rani Roopmati. The love story of this beautiful couple, who once ruled the region, is immortalized through marvelous structures, monuments, and palaces, built in their memories. Mandu or Mandavgad is a ruined city, which is celebrated for its fine architecture, created during Malwa period. 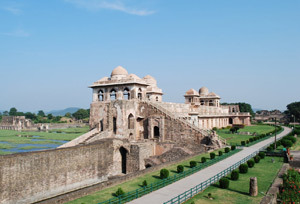 Located in the Dhar district of Western Madhya Pradesh, Central India, Mandu provides various impressive views of lakes, waterfalls, and incredible monuments, to lure tourists to visit the region. There are several places to visit in Mandu like palaces, mosques, Jain temples of 14th century and other buildings and the oldest mosque here dates from 1405. The finest of them all is Jama Masjid, which is a unique piece of Pashtun architecture. The strategic position of Mandu and its rich cultural heritage makes it one of the most popular tourist destinations in Madhya Pradesh. The incredible Afghan architecture and amazing baobab trees, originally from Africa, are important attractions that boost Tourism in Mandu. Some of the buildings in this region are recognized by UNESCO World Heritage Site, including Rupmati's Pavilion, which is one of the most popular tourist attractions in Mandu. History Mandu was originally founded in the 10th century by Raja Bhoj and was later conquered by the Muslim rulers of Delhi in 1304, who artistically built pavilions, monuments, mosques, etc. in the city to demonstrate their legacy. If we go back in history, we can see that Afghan Dilawar Khan, governor of Malwa, build his own little kingdom in Mandu and later transferred his capital to his son Hoshang Shah, who raised the splendor of the city. Later in 1561, Akbar conquered Mandu to add it to the Mughal Empire; however, Marathas came into power in 1732 to rule the region for a long time. Architectural Beauty of Mandu One of the prime attractions in Mandu is Rock Cut Caves that showcase enchanting paintings, adorned on the walls and ceilings of the cave. Another famous attraction of Mandu is 'the fort of Mandu,' which too draws a lot of tourists to visit its ornamented palaces, canals, bath, pavilions, etc. This fort area is 82 km in perimeter and is considered to be the biggest in India with ruins of Mughal architecture. Some of the most renowned palaces and monuments built during Malwa period are Hindola Mahal, Jahnaz Mahal, Hoshang Shah's Tomb, and Jami Masjid. All these places are significant to boost tourism in Mandu. Some people say that the structures here are so beautiful that Shahjahan himself was inspired to built one of the Seven Wonders of the World 'Taj Mahal' in Agra. Mandu is also known for its 12 huge gateways that reflect architectural brilliance, including Delhi Darwaza, Tarapur Gate, Jehangir Gate, and Rampol Darwaza. 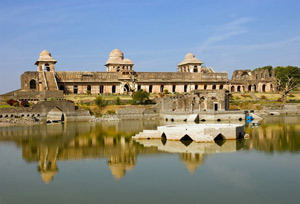 Baz Bahudur's Palace and Roopmati's Pavilion are other great buildings that one should visit, on their trip to Mandu. It is said that Rani Roopmati used to stay in her pavilions and view Baz Bahudur's Palace, which can be viewed very easily from here. Other popular sites that are not mentioned above, but are worth visiting includes Nilkanth Mahal, Hathi Mahal, Jali Mahal, Malik Mughis, Mosque, Dai ka Mahal, Darya Khan's Tomb, Dai ki Chhotti Behan Ka Mahal, Lohani Caves, Temple Ruins, and 'Delphic Oracle'. Go for a handicraft shopping at some local shops that sell sarees in Chanderi, block print, silk chiffon hand woven sarees, zardosi, maheshwari, padana, and mandsaur. Mandu offers several budget as well as luxury options to stay comfortably in the pleasant surroundings of the town. There are a lot of options that are easy of pocket like Dharamshalas (Guest houses), low budget hotels, economic hotels, homestays, etc. Most of the five star hotels in the area are located near the popular destinations like Jahaz Mahal, Hindola Mahal, Dai Ka Mahal, Rewa Kund, etc. 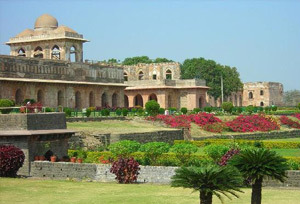 Some of the famous hotels in Mandu are mentioned below. Shopping in Mandu Mandu is a historic destination, located in the heart of Madhya Pardesh, Central Indian State. Its rich cultural heritage and great traditional values amazes tourists with mystical and unique craftsmanship. The local markets of Mandu offer various art forms to tourists in the form of handicrafts, fabric, decorative items, antiques, etc. There are several Craft Development Centres in Mandu that sells beautiful sarees in Chanderi, block print, silk chiffon hand woven sarees, Maheshwari, Gudi-Mudi, Khadi, Dabu prints, Tussar Silk Weaving, Bagh Prints, Tribal Saree collection, woollen carpet, cotton panja dari, leather crafts, etc. By Air: The nearest airport to Mandu is at Indore, which is around 110 km away from the city. One can avail private taxi or book a cab to reach their destination in Mandu from the Indore airport. Indore Airport is well connected to all the major cities of India including Mumbai and Delhi. By Rail: Indore Railway Station is the nearest railway station to reach Mandu. Tourists can get bus service or private taxis from the station to reach their hotel in Mandu. By Road: Mandu is easily accessible through road and can be reached easily from nearby cities like Indore, Jabalpur, Gwalior, Bhopal, Hyderabad, and Raipur. There are frequent bus services from these cities to reach Mandu; also one can book a private taxi to come this town on their own. Mandu can be visited at any time of the year, however, if you are very keen on enjoying the exquisite weather of the city, do visit it during the monsoon season. The emerald green landscape of Mandu looks prettier during rain. Winter too is not bad if you really want to experience cool breezy of this historic town in the months between October and Janaury.